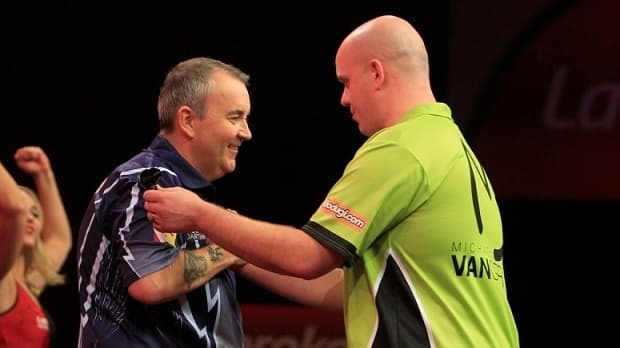 The Betway Premier League Darts season is now two games old, and our earlier tip on the winner is looking good so far with Michael van Gerwen having won his opening two games, although our outside tip, Raymond van Barneveld, could do with a few positive results after losing his first two. This is the match that darts fans have been waiting for, as world champion Gary Anderson takes on 2013 Premier League champion Michael van Gerwen. It promises to be a thrill-a-minute games with two of the sport’s biggest hitters going head-to-head. Anderson has had a great few months, and it’s testament to his form that ‘Mighty Mike’ is available at odds against in a one-off match. That’s not something that happens very often, and we should take advantage and back van Gerwen to avenge his semi-final defeat by Anderson in the World Championship. That game finished 6-3 to the Scottish player, and he went on to beat Phil Taylor in the Final. He repeated that success in the first week of the Premier League, when he beat the six-times Premier League Champion 7-5 at the First Direct Arena in Leeds. He won again last week when he accounted for Peter Wright 7-1, and is playing some of the best darts of his career. Michael van Gerwen is still one of the toughest opponents around though, and he tends to raise his game when he needs to. He bounced back from the World Championship immediately by winning the Masters just a few weeks later, and that’s the sign of a top, top player. He will want to beat Anderson tonight to cement his place at the top of the game, and also to gain his revenge for the World Championship defeat. Taylor has had a mixed start to the Premier league season, losing his first tie to Gary Anderson, before sweeping aside Adrian Lewis 7-2 last week. His form has actually been pretty consistent, and even in that 7-5 defeat to Anderson he missed a couple of crucial doubles that could have put a very different complexion on the scoreline. The doubles went in for him in the following match against Lewis, and he got his first points on the board. He should be too good for Stephen Bunting, who was beaten by van Gerwen last week, having drawn 6-6 with James Wade in week one. Bunting beat Taylor 10-9 in a brilliant tie in last season’s European Championship, but ‘The Power’ had won in their other two match-ups last year – 11-3 and 6-3 – and he’s worth backing to do so again. He remains, arguably, the best player to have played the game, and is certainly one of the most talented players throwing arrows today. When he’s at his best there aren’t many players who can live with him, and there’s nothing really to suggest his form is suffering in any way. If Taylor plays anywhere near his best he should be too good for Bunting, and can collect the points relatively easily. Raymond van Barneveld was our outside each-way tip for the Premier League, but last year’s champion hasn’t had the best of starts. He lost his first match of the new season 7-1 to a scintillating Adrian Lewis performance, before going a bit closer in a 7-5 defeat at the hands of Dave Chisnall. However it’s still early days and there’s plenty of time for him to improve his league position and qualify for the next phase of the competition. He’s a little more of a risky punt, but at a good price of 13/10 2.30 +130 1.30 1.30 -0.77 he can be backed to get his first points of the season on Thursday night. Peter Wright has lost both of his first two Premier League ties by a scoreline of 7-1; going down to Dave Chisnell on Day One of the competition, then Gary Anderson last week. It was only a few weeks ago that van Barneveld was beating Anderson in the Masters semi-final, before losing to van Gerwen in the final, and if he can raise his game to that level again, he should be much too good for Wright.